Toby Wong (Dacascos) is a man with something called a BioEngine in his chest. When it comes to his Martial Arts abilities, this prototype electronic device increases his speed and reaction time. Because it is apparently worth five million dollars, there are a lot of baddies that are after it. The leaders of the crew trying to capture Wong are Madison (Ferguson) and his sidekick Hedgehog (Walter). After a chance run-in at a bar, Wong meets aspiring songwriter Malik Brody (Hardison). Brody recently lost his house, his wife (Lathan) and his job. So even though Wong “kidnaps” him, he no doubt feels he has nothing to lose by sticking with Wong throughout his wild adventure. Plus, Wong offers him half the money if he’ll DRIVE him from San Francisco to L.A. But the baddies are never far behind. They check into a hotel and meet a quirky girl named Deliverance (Murphy) and she helps them out for a while, but the final confrontation is at a karaoke bar, where all hell breaks loose... who will come out victorious? It’s easy to see why Drive is widely praised for being one of the best DTV’s ever. It’s an extremely entertaining ride with excellent Martial Arts choreography, stunts, action, and plenty of humor. It never takes itself too seriously, hence bizarre inventions like the TV show “Walter The Einstein Frog” which characters seem to always be watching. Needless to say, Drive is the original Drive (2011) - didn’t the makers of that movie know there was already a movie with that title? They inadvertently showed their film ignorance. Drive is also the original Rush Hour (1998) - the comparisons are easy to see. Plus Drive is the original Crank (2006) - because the BioEngine in Wong’s chest has his adrenalin levels artificially raised and he has to deal with the consequences. There are references to other movies as well - such as The Defiant Ones (1958), or Fled (1996), if you prefer. 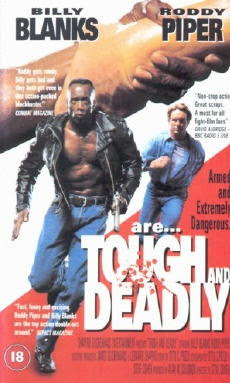 At one point Malik says Toby is “The original Five Fingers of Death”, and when a cop asks Toby’s name, Toby replies “Sammo Hung”. So genre fans have little winks and nods in their direction, if they’re paying attention to that sort of thing. Hardison is genuinely funny as Malik - and as the man who gets thrown into this confusing situation, even as he pines for his lost wife - you actually feel for him as well. Compare this to the similar but much more horrible Mercenary 2 (1999). Robert Townsend is just annoying and Olivier Gruner has no personality. Whereas Dacascos executes his exaggerated moves with panache, and even sings and dances at one point! What more could you ask for? As Toby and Mark go on the run, there’s plenty of “90’s tech” on display for nostalgia purposes. Not to mention a few songs on the soundtrack that scream “90’s!”, the most memorable of which is “Where’s the Party At” by Intellect. Mr. Intellect would probably be insulted by this, but the song is very Kris Kross-esque. But the movie is truly action packed, and delivers what you want, and more. It even avoids a couple of cliches along the way. It’s a fast-paced crowd pleaser, and we definitely recommend it. A note about the DVD we viewed: We watched the 1 hour and 53 minute British DVD, which is the director’s cut. It restores about 15 minutes to the movie, which is substantial. 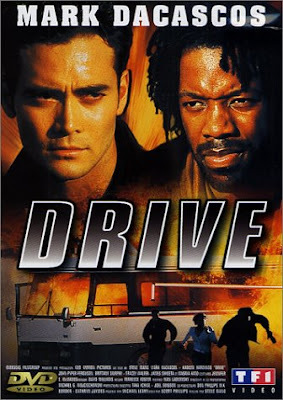 Because it is in widescreen with a ton of extras, we strongly suggest you track down this DVD for the most complete “Drive” experience to date. Also check out write-ups by our buddies, DTVC, The Unknown Movies and The Video Vacuum! In Denver, Colorado, George DeSalles (Milland) is a hot shot businessman at the top of his profession. He contacts a group of men (the said “hit team”) with the intention of killing his wife. This begins to unravel the dominance of the hit team in Denver. The main triggerman is an unstable maniac named Dave Poohler (Saxon). He’s frantically going around town trying to hide from the cops, as well as his fellow partners-in-crime. Everyone seems to want to get their hands on this Poohler guy. What will be his fate - and the people searching for him? It appears The Hit Team, or, Company of Killers as it is also known, was originally intended as a TV movie back in 1971, but then got a theatrical release. Flash forward to the 80’s, when video stores were hungry for product to fill their shelves. They would take just about anything, regardless of its quality. 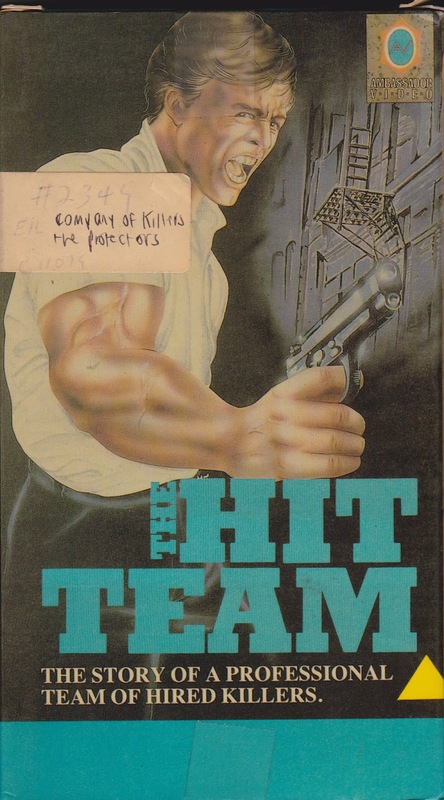 The Hit Team was probably inexpensive to acquire, and it was simply gussied up with some nifty artwork. It seems The Hit Team is a classic case of being suckered in by the box art. If you look at that yelling guy with the gun, you figure you can’t go wrong. Unfortunately, this is a boring, staid, old-fashioned programmer where nothing happens of any excitement. Despite the cast of quality names, this is a dry, dull procedural that doesn’t even come close to rising above the pack in any way. It’s very slow, especially by today’s standards. It’s just a bunch of dry, unengaging scenes piled on top of each other. It seems the filmmakers didn’t make much effort to really involve the viewer. It’s sad, really, because with this cast, the movie had potential. 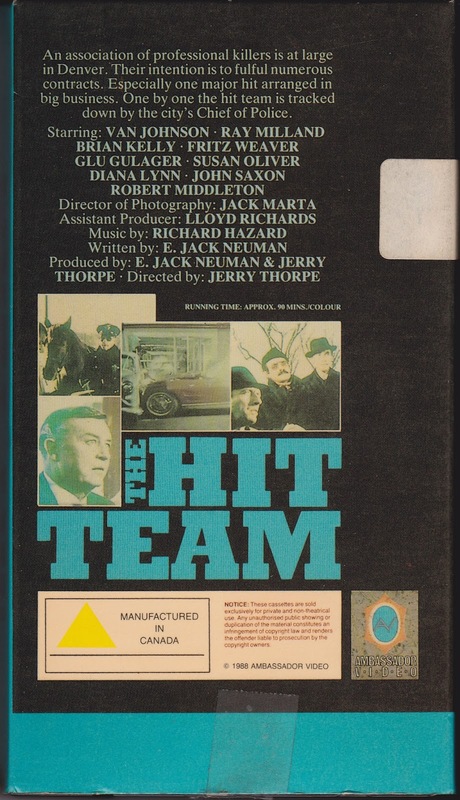 Even though The Hit Team is deservedly obscure, John Saxon does put in a very good performance and manages to stand out. But it’s not nearly enough to save the whole movie. People like Ray Milland only add to the sense of stodginess. Saxon can’t hope to overcome that. Because it was 1971, there are some great mustaches and big hair on display, and the movie even starts out like Police Squad! (or The Naked Gun series) with a camera mounted on top of a police car as it drives around. 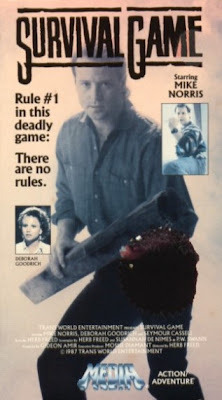 The way we viewed the movie was the Canadian VHS, released on Ambassador Video. There are some notable errors on the box (besides the fact that they make the movie out to be something that it’s not) - they list the running time as 90 minutes, but it’s really 72. According to the description, “Their intention is to fulful numerous contracts”. I know I had a sense of fulfulment. Also, someone named “Glu” Gulager is involved. We realize “Clu” isn’t the most common name, but Glu? Come on. Maybe the box was written by a French Canadian that had never tried his hand at English before. In all, we feel The Hit Team will more than likely bore you to tears. 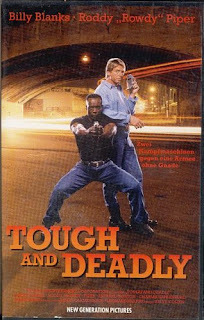 Really the only reason to ever buy this VHS is for lovers of box art that want this cover in their collection. Otherwise, unless you want a cure for insomnia, we say avoid. 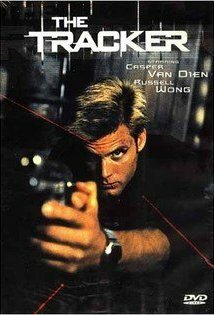 Connor “Connie” Spears (Van Dien) is a former NYC cop who moved to L.A. to become a private detective. 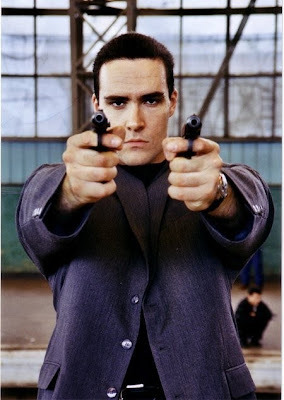 When an old friend who he trained in Martial Arts with, Rick (Wong) contacts him because his sister was kidnapped, Spears agrees to go back to his old New York stomping grounds to try to find her. 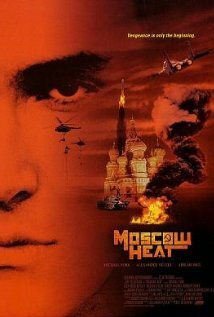 The plot thickens when it seems she’s caught in between two rival gangs: the Chinese mob and the Malakov family of the Russian mob. 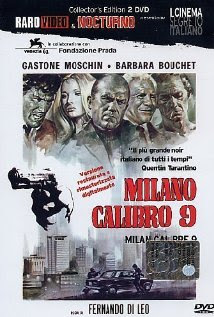 Teaming up with the streetwise taxi driver Carmen (Robertson) and old cop buddy Jack “Chick” Cicollini (Blicker), our team of four unlikely heroes hit the streets to try to find the missing girl. Will they find her before it’s too late? 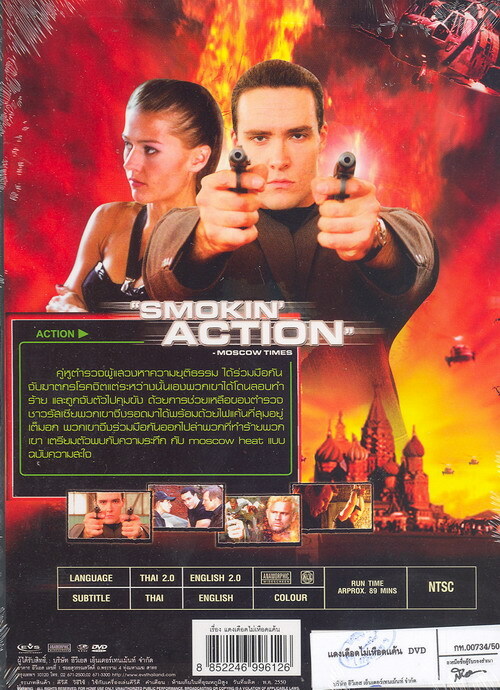 2001, when this movie was released, wasn’t that far from the 90’s in time. Thus, The Tracker fully retains a 90’s feel. It’s standard DTV fare, but it’s professionally made and doesn’t look like junk. While it doesn’t reach the heights of Drive (1997), a movie it seems to be influenced by, it makes a decent one-time watch, mainly because of the Martial Arts scenes with Russell Wong. There’s plenty of other reasonably enjoyable stupidity on display, mainly in the action scenes. Add a little humor, and there you have it. 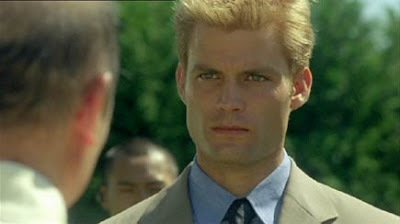 Casper Van Dien’s blonde hair and snarky attitude gives him the vibe of Billy Idol. Was that intentional? But because he’s supposed to be the ultimate coolguy, with an answer for everything, that puts him more in the category of being the Zack Morris of action (or Zacktion to those in the know). Throughout most of the 90’s, and into the 2000’s, having the main character in a movie or TV show spouting sarcastic, ironic retorts all the time became the norm. Somewhere along the line, writers got off the track, and being the likable hero got confused with being the snotty jerk. Van Dien in The Tracker is a perfect example of this. Is he supposed to be likable? We assume yes, but he doesn’t make it easy on us, the viewing public. This “Coolguy-is-a-jerk” phenomenon was a misstep in pop culture, in our opinion. 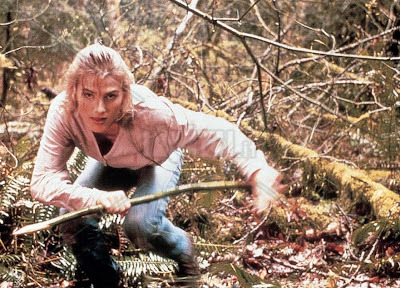 Of course, we blame Sloane (1984) for starting it all. The movie is really nothing more than a compendium of cliches, from the prerequisite torture scene to the abandoned warehouse shootout, but that might be one of the movie’s strengths after all. The Tracker is what people rented in video stores when everything else they intended to rent was out for the evening. For better or worse, Connor Spears (remember this was the heyday of Britney) did not return for another outing. There were to be no franchises for him. 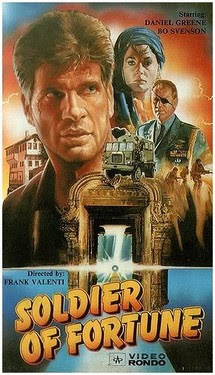 It would have been interesting to see an Indiana Jones and the Last Crusade (1989) kind of thing, where Howie Long plays Casper Van Dien’s father, and they can compete to see who has the squarest head. So that was not to be, but at least we have this, and we’re all happy about it, right? ....right? Also check out a review by our buddy Keith from The Unknown Movies! The Monsignor (Estrada), Father Thomas (Vincent) and their helpful assistant Merna (Landers) live and work at a church in a “bad part” of L.A. One day, a man named Father Daniel (Foley) comes to join their parish. The only thing about Father Daniel is, he’s a Martial Arts expert who uses his Cross-emblazoned gun, knives and even throwing stars to take out the trash of the city. He even uses the confessional for tips on where to go. But if the parishioners don’t give him enough info, he uses his psychic powers to find out more. While trying to keep his double life secret, he meets a fellow psychic, Kim (Chambers), who he takes a liking to. Meanwhile, there’s a sadistic serial killer stalking the city named Otis (Stroud), who drains his victims of blood and saves their skulls. But Father Daniel saves people’s souls, so the two men are mortal enemies. When Otis kidnaps Kim, the ultimate showdown ensues. Or something like that. You would think a movie about a psychic priest who kills his enemies with throwing stars with the Cross on them would be a surefire hit. But in the hands of director/co-writer Rundle, this one idea is not enough to sustain a 90 minute movie. Thus there is plenty of filler which dilutes this killer idea. A wise man once said “you cannot intentionally make a cult film” and that seems to be the case here. Sure, the movie is loaded up with quality B-movie names, but it could definitely be argued that they are not used to their full potential. Add to that some muddy, muffled sound where the music is louder than the dialogue and a lot of repetitive scenes (such as the oft-repeated “Breakfast” scene) and, far from a unique winner, we’re bordering dangerously on dud. The credits of the movie misspell Erik Estrada’s name (crediting him as “Eric” with a C), while the VHS box (released by Prism) has it correctly. He does more-or-less a “sit-down” role, as does Jan-Michael Vincent, who does an out-and-out sit-down. Vincent just sits at the breakfast table with his newspaper and slurs a few lines. Sure, there’s something endearing about it, but he’s so under-used. 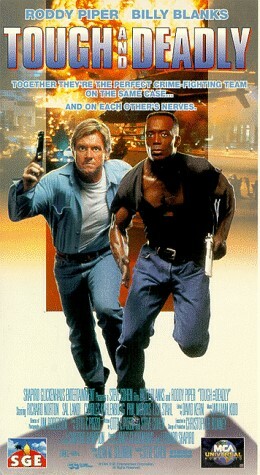 And speaking of under-used, Jim Brown and Robert Z’Dar are on screen for literally seconds as incidental drug-dealers. More should have been made of them. Don Stroud plays the deranged killer with aplomb, but his scenes contain the most filler. And who is this Michael Foley, who plays the main role of Father Daniel, you ask? He was in Lionheart (1990), Karate Cop (1991) and Intent To Kill (1992) - but he’s still kind of an odd choice for a leading role. Some of the better moments in The Divine Enforcer comes from the random scenes - plenty of parts have no explanation, and that combined with the amateurish acting usually provides the VHS gold we’re always looking for. But it’s a battle against filler. Ken Davitian shows up in an uncredited role as a club owner watching the singer Hiroko (and her stellar backup dancers) do a performance. Her song “My Love’s Waiting” temporarily livens things up, but this movie is still fairly disappointing. In all, the idea of the Father Daniel character is excellent, but, sadly, the movie as a whole is mishandled, not getting the maximum bang for the buck from the idea. After making off with a stash of money and heading to the Philippines, gangsters Baku, Lopez (Hunt) and Joe (Takeuchi) are ambushed by the supercriminal Yamaneko, or “Wildcat” (Monty). Baku is killed, Lopez disappears and Joe is gravely wounded. He manages to stumble into the restaurant of Rei (Yoshida) and she nurses him back to health. Once back in fighting shape, his intention is to find Lopez, then find Yamaneko, to get revenge for his fallen partner Baku. Rei gets swept up in this mission, and a mysterious man named Ratts (Sugata) does as well. But it’s not going to be easy, because Yamaneko controls a virtual army of heavily-armed baddies. But Joe forges ahead anyway...is this going to be a good idea? Guns, guns and more guns! 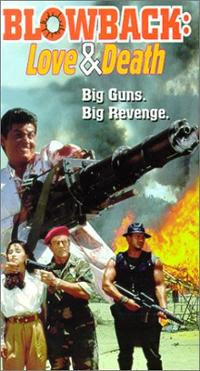 Blowback: Love & Death (or Blowback 2) is perhaps the ultimate non-John Woo “Gun-Fu” film. 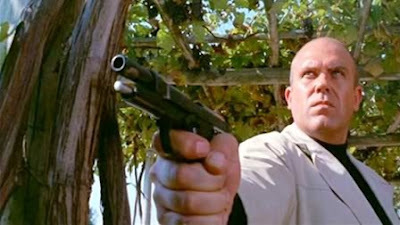 While influenced by Woo, it seems the major driving force behind this movie was Sergio Leone’s Westerns. Even the black-and-red animated title sequence gets you in a Leone frame of mind. And there are plenty more Leone references along the way. But it all adds up to be an entertaining gangster drama, with an exploding guard tower or two. (It was the Philippines after all, and they don’t let you leave without at least one). It is nice to see someone besides an American film production utilizing what the Philippines have to offer as far as film backdrops go - in this case it’s the Japanese. Riki Takeuchi makes a very cool anti-hero, and while he has had a long and fruitful career in his native Japan, stateside fans of the work of Takashi Miike and the five movies he puts out a month will recognize Takeuchi from the Dead or Alive series (he was in all three), Fudoh: The New Generation (1996) and Deadly Outlaw Rekka (2002). With his slicked-back pompadour, sunglasses and open Hawaiian shirts, and brandishing tons of guns, it’s hard to be much cooler. As for director Muroga, this was his first film, and he followed it up with two movies that found their way to American DVD: Score (1995) and Junk (2000). While both of those movies have their moments, Blowback 2 is arguably the more all-around satisfying experience, and a good place to start with Muroga nonetheless. Muroga certainly succeeds in making Manila and other parts of the Philippines look hot and humid. It seems everyone is sweaty and flushed in this movie. That brings us to the villain of the piece, the fan favorite Mike Monty. Here, he really, really, REALLY looks like largely-hated New York City Mayor Mike Bloomberg. We guess that goes a long way towards bolstering his bad-guy status. He just resembles Bloomberg so closely, it’s a laugh riot: “Oh no, Bloomberg’s on the rampage!” And aside from “Bloomberg” being in this, Blowback 2 offers some nice surprises to keep you on your toes, especially the (yet more Spaghetti Western-inspired) ending. Asia Shock did a great job with the VHS of Blowback 2. 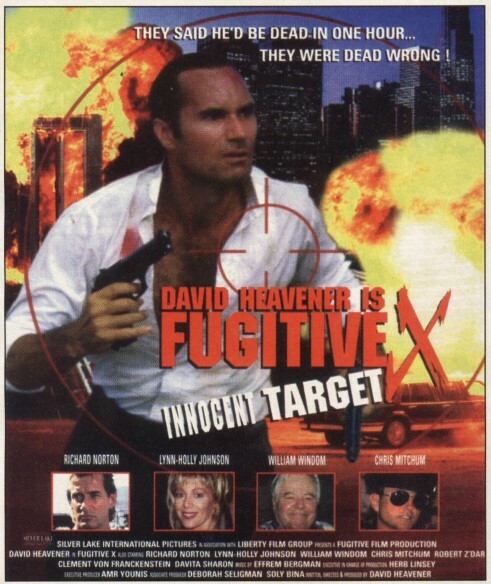 They were one of the few companies releasing subtitled VHS tapes of exploitation cinema. We’re so used to watching shoddy dubbed versions, this came as a nice surprise. It’s great to see they actually care about the material. That being said, it doesn’t seem like this was one of their more widely distributed titles. Regardless, if what you’ve just read floats your boat, Blowback 2 should be worthwhile viewing. In the thick of the Vietnam war, Viet Cong killers attack some Christian Missionaries. Some U.S. Special Forces come to save them, but their only means of escape is an old school bus. Seizing the only opportunity available to flee from the enemy onslaught, they begin their trek on the bus. But it’s going to be a treacherous ride. Now faced with this not-particularly-ideal situation, will the soldiers protect the Missionaries and destroy the enemy? Warbus is director Ferdinando Baldi’s take on the Vietnam jungle actioner replete with multiple shots of waterfalls, plenty of machine gun shooting, huts which may or may not explode, and all manner of blow-ups. But these blow-ups are notable in that they are of a high quality. It appears most of the budget for this film went to the pyrotechnics. And if you do indeed have a limited budget to work with, that’s actually very smart, because Baldi clearly knows his audience. 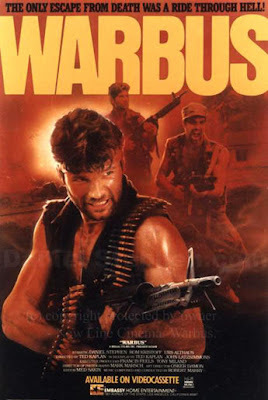 If you’re renting/buying or somehow viewing a movie called WARBUS, you don’t want to disappoint action buffs. On that same topic, there is minimal dialogue, but what dialogue there is has that funny dubbing we all know and love. As far as the characters, we really don’t know who these people are, but does it really matter? The movie is a brief 79 minutes, which makes sense because it’s probably hard to do an entire feature-length movie about a Warbus. The bus in question has the words “SCHOOL BUS” proudly emblazoned all over it, and its license plate is NGH 666. So make of that what you will. On the negative side, Warbus is a little more run-of-the-mill than it should be for a good portion of the film’s running time. The problem is this one simple idea. The movie is like a 79 minute action SCENE, not so much a fully fleshed-out movie. Nothing sticks with you, there’s nothing to hang on to once the movie ends. Adding to that, the Mercs DVD has some tracking issues. You wouldn’t think in the age of DVD, a DVD would have tracking issues, but because it was obviously taken right from a VHS, there you go. But we’re lucky to see the movie to begin with. Let’s not look a gift bus in the mouth. Plus Warbus should get some credit for being the original Speed (1994). There’s nothing actively bad about Warbus - we’d say it’s a minor and inoffensive entry into the Exploding Hut Movie sweepstakes. With Warbus, we’re solidly in one-time-watch territory.